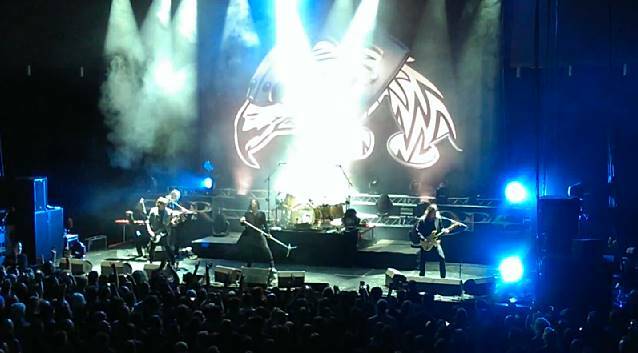 Swedish hard rockers EUROPE performed their 1984 album, "Wings Of Tomorrow", live in its entirety last night (Monday, March 3) at the opening show of their Swedish tour in Stockholm. Says EUROPE singer Joey Tempest: "WOW! "We did not expect that reaction! "A Monday in Stockholm. We thought perhaps the band would be more drunk than the crowd. It turned out to be a great vibe and a great evening. "Playing our hometown is always a bit special and we were a bit on edge. First gig on the tour, and we hadn't played the songs from 'Wings Of Tomorrow' in many, many years! "[John] Norum [guitar] has recently switched back to his Fender Strat! And this was all very exciting. Afterwards, he said it felt a bit strange since he's so used to his Les Pauls, but he loves the sound of the Strat and wants to use it more, perhaps on the next EUROPE record as well. We in the band love it. He really knows how to play that thing; he looks great playing it and it has a great sound! "We recorded 'Wings Of Tomorrow' just a few blocks away from were we played last night, at the legendary Polar Studios. We were around 19-20 years old when the engineer Leif Mases treated us to listening to one-inch tapes of LED ZEPPELIN and SCORPIONS who had been recording there earlier. We couldn't believe that we finally were in a 'real' recording studio, at the same time we felt we had something special going on. "'Wings Of Tomorrow' became very important for the band. CBS Records in New York heard it and wanted to sign a massive contract with us. "'Wings' gave us wings! We started to get recognized internationally. But most importantly, the fans loved the album and it also inspired other musicians and rock bands. That is the best feeling. "Last night, Mike Amott joined us as a guest on the song 'Wings Of Tomorrow'. His band ARCH ENEMY has recorded both 'Wings Of Tomorrow' and 'Scream Of Anger'. He is a friend of the band and grew up listening to EUROPE's music. It was an honour and so much fun to have him with us on stage! "Afterwards, we were so relieved. So many things could have gone wrong but lady luck was on our side. "Three more gigs in Sweden and then we start touring the rest of the world again. "The idea is to record our tenth studio album this fall. We have some plans for the U.S. the next coming years and we are really looking forward to that. "As always…...All this is because of YOU! You keep supporting us and lifting us up. The word is truly spreading about EUROPE."